5 ABV 27 IBU F.G. 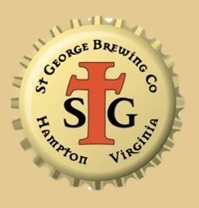 Description: St. George Black Forest Ale is impenetrably dark with a thick mocha colored head. Flavors of Biscuit and caramel are well balanced with a light hops character. 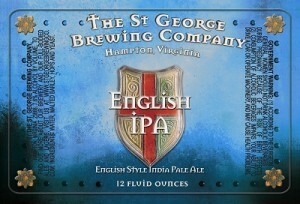 Description: St. George English IPA is traditional English style ale with distinct hop spiciness from 100% UK Fuggles hops. Deep copper in color, Our India Pale Ale has a full malt base and a pronounced hop aroma and is extremely well balanced. 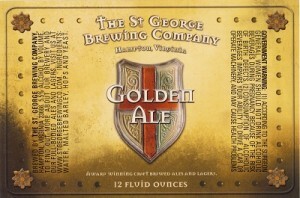 Description: St. George Golden Ale is based on an old British recipe but with American Centennial and Cascade Hops. The brew results in a slightly sweet, malty flavor with a citrusy hop character. It is golden straw in color with a thick creamy head. 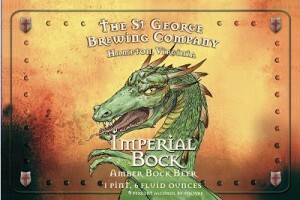 Description: St. George Imperial Bock is based on one of our favorite styles of German lagers. reddish amber in color with a thick white crown. 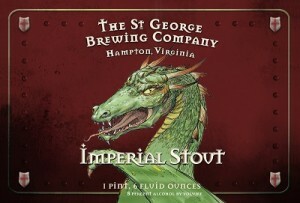 Description: St. George Imperial Stout is our tribute to the Russian Tsars of old. This Russian Stout is a huge beer. 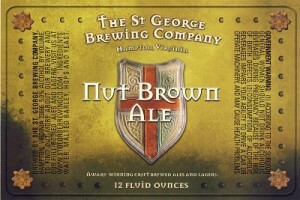 Description: St. George Nut Brown Ale is a classic English-style Brown Ale with flavors reminiscent of biscuit and caramel that is well balanced by a mild hop character. This beer was traditionally served in taverns as their house beer. Our Nut Brown Ale is light brown in color with a thick creamy head. 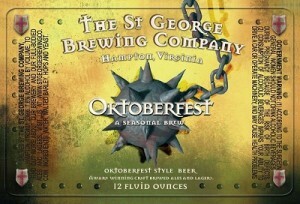 Description: St. George Oktoberfest is a classic German style with roasted malt and caramel flavors balanced by a mild hop bitterness. This beer was traditionally served at the start of fall in celebration of the harvests. Our Oktoberfest is pale copper-color lager. It pairs well with warm pretzels and lederhosen. 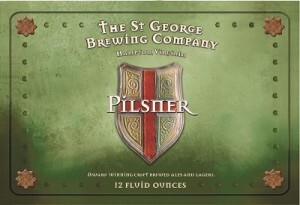 Description: St. George Pilsner is a clean, crisp lager based on an old north German beer recipe. A centuries old conditioning process and unique lager yeast result in an exceptionally smooth beer. Traditional 2 Row Pale and Munich Malts along with noble German Hops ensure a well balanced, pale golden lager with a fine creamy head. 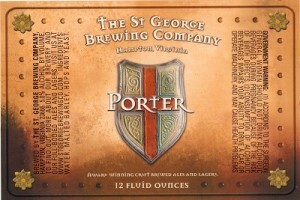 Description: St. George Porter is based on a traditional English style porter. This beer weaves a complex tapestry of flavors in a ruby black colored ale. A rich malt base results in caramel and chocolate tones classically balanced with English aromatic hops. 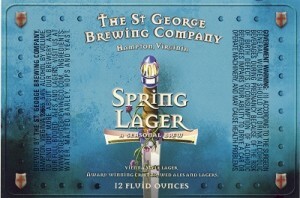 Description: St. George Spring Lager is our representation of the original lager beer. Sharing its roots with the Maerzan and Oktoberfest beers, this Vienna-style lager is brewed using classic European malts resulting in an amber colored beer with a rich, malt character while traditional German hops provide a noble and perfectly-balanced hop bitterness. 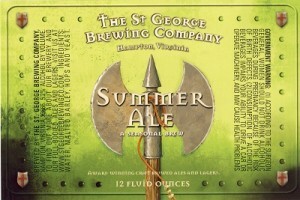 Description: St. George Summer Ale couples an aggressive late hop character with a medium bodied ale to produce a highly-drinkable, thirst-quenching beer. A slight maltiness and perfectly balanced hop bitterness along with its classic English hop finish makes this is the perfect drink for beating the summer heat. This ale is a very pale golden color with a thick creamy white head. 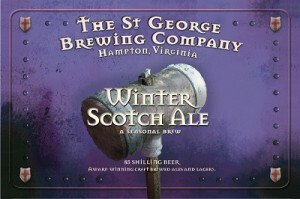 Description: Our Latest release, St George Winter Scotch Ale is a malty, full bodied ale with a delicate hop effect allowing wisps of peat smoked malt interwoven with a slight roastiness to come through. Dark copper in color and finishes with a lingering peat smoke effect. A perfect seasonal for enjoying in front of the fireplace..